Loggerhead sea turtle nesting was near a 24-year high along Florida beaches this year, according to data compiled by Florida Fish and Wildlife Conservation Commission (FWC) researchers. The loggerhead is listed federally as a threatened species. Trained surveyors from partners across the state count nests on nearly 250 miles of beaches as part of the Index Beach Nesting Survey. Surveyors follow firm counting guidelines, making it possible for FWC researchers to use the data from these beaches to identify trends. In 2012, index beach surveyors counted 58,172 loggerhead nests, one of the highest counts since monitoring began in 1989. Nesting on these beaches peaked at 59,918 nests in 1998, and hit a low of 28,074 in 2007. As hatchlings will continue to emerge from nests through November, people are asked to stay at a distance if they spot sea turtles on the beach. People are also asked to remove beach furniture and other objects from the beach at night so there is a clear path for hatchlings to make it to the water. In the U.S., 90 percent of all loggerhead nesting occurs in Florida, the majority of which takes place along the state’s east coast. The loggerhead is the most common sea turtle species to nest in Florida. Green turtles and leatherbacks, federally endangered species, also nest on Florida beaches, primarily on the east coast, and their nesting numbers have been increasing over time. Since tracking began in 1989, green turtle nesting in Florida has increased about tenfold. This year, surveyors found 6,054 green turtle nests on index beaches, down from last year, but consistent with normal variation. Leatherback nesting in Florida also has been on the rise since monitoring began. For the 2012 season, surveyors counted 515 leatherback nests on index beaches. Only 45 leatherback nests were counted on the same beaches in 1989. The extensive data collection is made possible with the help of hundreds of surveyors from conservation organizations, universities and federal, state and local governments along with private volunteers. These and other partners also provide data to FWC researchers through the Statewide Nesting Beach Survey, which documents all sea turtle nesting in Florida. 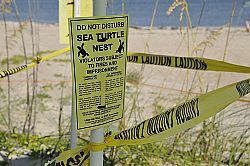 The FWC's role in coordinating Florida’s sea turtle nest counts, training surveyors and compiling data is funded by the U.S. Fish and Wildlife Service and sales of the state's sea turtle license plate. Report sick or injured sea turtles to the FWC’s Wildlife Alert Hotline at 888-404-FWCC (3922).